You will find a lot of firsts when you visit the Karoo, especially if you visit its prettiest town Prince Albert. Descend the World Heritage Swartberg Mountain Pass or turn off Route 62 and you will discover a gem of a town offering True Karoo Hospitality with its 4-star De Bergkant Lodge, a Heritage building with first-class amenities situated at the start of main Church Street. In keeping with De Bergkant’s cool, spacious and refined accommodations, Prince Albert also offers a choice of upmarket restaurants and; what has been described by many, as a ‘world class theater’ to deliver you laughter, drama and big screen thrills all in the heart of the Karoo. Just a short stroll down from De Bergkant Lodge, The Showroom Theater is easily recognised by its beautiful art deco façade which adds a delicious flair of avante gard in a village renowned for its royal roots and olde-world charm. Inside, relax in its Champagne Bar and intimate arena seating and enjoy the delightful décor which is all recently renovated. What was once a car showroom has been transformed into a theater of magical storytelling form across film, stage and screen for theater audiences both young and old. Recently, you could have been rolling off your seat at the sharp-witted dialogue of author, actor and activist Pieter Dirk Uys. With his booked-out one-man show, he depicts a repertoire of characters which usually includes a South African favourite, Afrikaans socialite Evita Bezuidenhoud. Uys, a regular guest at De Bergkant Lodge will be continuing his Karoo theatre tour during March to include an appearance on the 25th March at the Klein Karoo National Arts Festival in Oudtshoorn. With a deep understanding of South Africa and its people, Uys has performed on stage 7 000 times, both touring internationally and performing at his own theatre Evita Se Perron in Darling. His influence and his works can be explored on his personal website where he shares interviews as well as current and archival play texts to be shared by students, teachers and fans alike. The Showroom Theatre has also hosted names such as Nianell, Matthys Roets, Anna Davel, Heinz Winckler, Rocco De Villiers, Barry Hilton, Gys De Villiers, and a host of other performers, shows and film festivals and sets a standard in dramatic arts on the Karoo’s tourism map. A collaboration between local business woman Charon Landman and film maker Johnny Breedt, the aim of The Showroom is to create a multi-cultural venue for the community of Prince Albert and visitors alike. The venue is used as a theatre, cinema, gallery, seminar venue, and for the future, a film school and boasts state-of-the-art theatre and cinema equipment. March theatre offerings include The Tragedy of Hamlet, an Abba revival show by Mike McCullagh & The Harmonix, musician and songwriter Anton Goosen, and upcoming performance in April by Jan Hugo (pianist) and Clara Huge (voice), star of the cabaret stage Emile Minnie, and songsters Paul Andreas & The Late Bloomers. Don’t miss the movie Five Fingers for Marseilles, a gripping South African ‘western’ style offering set in Apartheid South Africa, or the more surburban ‘A Simple Favour’ a stylish post-modern noir piece about a mommy vlogger. For younger audiences the big screen offers Smallfoot a modern animation about a friendly Yeti. To find out what’s on when visiting Prince Albert call the box office on +27 (0) 23 541 1563. 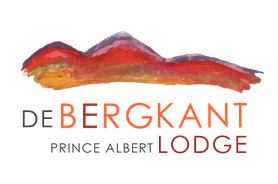 To book a restful stay, make a reservation at De Bergkant Lodge at www.debergkant.com or call Michael or Renate on T +27 (0)23 541 10 88.